Mulan, Disney’s animated retelling of a Chinese legend, is filmic chop suey – a Chinese dish created in America. Though the filmmakers clearly researched ancient China, the movie’s sensibilities seem distinctively American. The imposition of Disney’s formula on the story doesn’t always work, but the movie does have some good moments. A new two-disc DVD set from Disney has in-depth special features on the making of the movie that may appeal more to adults than to younger viewers. One of the animators for this movie worked on Snow White, Disney's first animated feature. The two men in charge of the fireworks near the end of the movie are caricatures of the directors. Mulan is said to be based on a true story of a young woman in ancient China who took her crippled father’s place in the army to fight barbarian invaders. The Disney version gives Mulan (voiced by Ming-Na) Mu Shu, a wise-cracking dragon sidekick (a very funny Eddie Murphy), sent by her ancestors to protect and guide her. It isn’t easy fitting into a man’s world, but she eventually gains the respect of her fellow conscripts, the handsome captain Li Shang (B.D. Wong), and even the emperor (Pat Morita). All the familiar ingredients of Disney animated movies are mixed in: slapstick comedy, adventure, scary parts, wacky sidekicks (both animal and human), a little romance, lessons learned, and some show tunes thrown in. The humorous and scary parts sometimes clash. The songs feel obligatory and aren’t particularly memorable. Also, the slapstick wears thin — not once, but twice, do the behinds of characters catch on fire. The best part of the movie is its strong female character at the center. Disney had been criticized for creating female characters with Barbie-doll figures whose main goal is landing a man. Mulan is a more action-oriented hero who uses her brains to save the day. Surprisingly, most of the special features seem to be geared more toward older children and adults. Disc one has a commentary track with producer Pam Coats and directors Tony Bancroft and Barry Cook. They have a lot to say about the development of the story and certain visual choices they made. They also acknowledge cliches that often turn up in Disney movies – they decided that they didn’t want the bad guy to fall to his death. Seven deleted scenes — actually storyboard montages with voiceovers – are introduced by the directors, with explanations of why they weren’t used. Mulan’s Fun Facts is a short behind-the-scenes montage with pop-up facts about the production of the movie. The most kid-oriented feature on this disc is Mulan’s World, which has facts about Chinese history and culture and the legend of Mulan. Also on this disc are four music videos of songs from the movie, including one with martial arts star Jackie Chan singing “I’ll Make a Man Out of You,” in Mandarin (Chan provided the voice of Shang for the Chinese release of Mulan). It’s a boring video with repeating images of Chan doing some martial arts moves. A fifth music video, a Spanish version of “Reflections,” by an unidentified singer seems out of place on disc two. 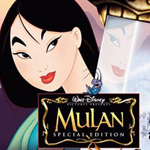 Another uncredited feature on disc two is The Ballad of Hua Mulan, which has a voiceover of the story of Mulan in verse with a montage illustrations. It has the look and feel of a children’s book and would appeal to younger viewers. Presumably, the verse is a translation of the Chinese legend, but the DVD never gives the source. Some of the illustrations are clearly drawings and paintings from the movie, but other images look very different. It would have been nice to know the source of the illustrations. And finally, the narrator isn’t identified. It sounds like Ming-Na, but some credit would have been appropriate. Most of the features on disc two go in-depth into the production of the movie, from a pre-production trip to China to the foreign-language dubbing. One of the more entertaining extras is the “I’ll Make a Man Out of You,” sequence played in various languages. A great deal of emphasis is placed on the development of the movie’s look. There are a myriad of galleries with stills, storyboards and visual concepts that were tried and abandoned. A progression demonstration shows two sequences from the movie from storyboard to completion. The angle button on the DVD remote switches between the four stages of animation for these scenes. Both picture and sound are up to Disney’s high standards. The DVD also has Spanish, French and Mandarin language tracks.